Two French sailors have died and four others are missing after a French fishing vessel sank about 50 miles (80km) off Cornwall. Two French helicopters were first sent to search for the crew of La P'tite Julie at its last reported position south of The Lizard at about 0400 GMT. 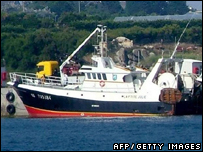 French authorities said one of seven crewmen from the 24.6m (81ft) trawler had been rescued and two bodies found. Two helicopters from RNAS Culdrose have been assisting. One pilot said wreckage could be seen over a wide area. Two empty life rafts were found in the area where the trawler radioed for assistance before sinking. British rescue services were alerted to the incident at about 0700 GMT. Coastguards at Falmouth were contacted by French authorities and the first helicopter from Culdrose was scrambled at about 0730 GMT. Helicopter pilot Lt Chuck Norris said: "We arrived at the scene at 0810 to find a French fixed-wing aircraft coordinating the search, and a French helicopter. "We searched about 20 square miles in three hours. We found lots of wreckage and bits of fishing kit from the boat, but we found no survivors." Sylvain Le Berre, a spokesman for the local French maritime authority, told the AFP agency that two bodies were recovered and one man was rescued suffering from hypothermia and severe shock. The injured man was taken to hospital in Brest. Falmouth Coastguard said French authorities were co-ordinating the rescue, but that weather conditions could hamper any rescue. James Gilbert, from Falmouth Coastguard, said: "Winds in the area are anything up to severe gale nine, which does make it a little more difficult and more worrying for the people that are missing." He added that sea temperatures were also a concern. He said: "At the moment it will be cold, which will affect the time of the sailors' survival." Lt Norris said that winds were blowing at 35 knots from the west. The vessel, which had a Franco-Portuguese crew, was first launched in 1991 and based at Erquy harbour.